Check out recaps of other episodes by clicking the the Project Runway tab. The craziness all starts this week when Heidi Klum walks onto the runway with a duck on a leash to tease the designers - then it's off to the workshop. On entering, they quickly realize they are surrounded by mountains of duct tape in every colour and pattern imaginable. Michelle's comment, "Holy duct tape Batman!" Tim Gunn introduces the rep for Duck Brand duct tape, Bill Kahl, who is wearing a duct tape tie. This company holds a Stuck at Prom contest for prom goers every year where couples create tuxes and dresses out of duct tape. Winners receive a $5000 scholarship. It's pretty clear by this point there will be another unconventional challenge. The designers are to work in teams of 2 to create a prom dress out of duct tape that is fashion forward, fresh and innovative. They have one day and will be showing the designs that evening to a group of high schoolers who will give comments and vote on their favourite. These votes will count for 20% of the garment's final score. The winner of this challenge will have $5000 donated in their name to Autism Speaks courtesy of Duck Brand. 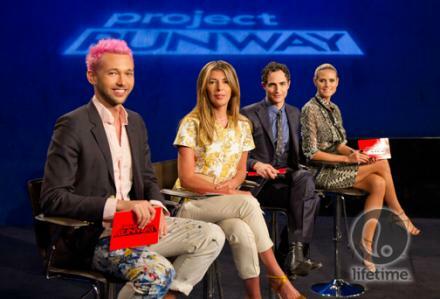 Guest judge will be fashion designer Chris Benz. Stanley chose to work with Layana which hurt Richard's feelings as they were such a great team last week. Stanley wanted to work with someone new, but got more than he bargained for. Layanna forced a change the colour scheme and then constantly nattered about the design....nag, nag, nag. She fussed and worried through most of the process instead of just buckling down and working. It had to wear. Kate chose to work with Tu as she found him nicer all around. Unfortunately Tu had never been to a prom and had absolutely no idea where to go with this creatively. His construction skills are also not that strong. In the end the pairing went okay because Kate made all the decisions and Tu assisted. This team lacked someone with a creative, out-of-the-box spark as the final dress was very expected in terms of design. Students felt this dress looked most like a real prom dress was which was a good thing in their eyes, but that wasn't the challenge. Michelle chose to work with Amanda and they were a good team. Michelle brought edginess in spades and Amanda pulled her back from taking it too far. In the end they came up with something funky and very original - a Punk girl prom dress. They couldn't agree on which pattern tape to use, so took 2 colours of duct tape and created an abstract print based on houndstooth. In Michelle's mind, "Everyone wants the funkiest, most different dress. They don't want to show up and find someone with the same gown." Surprisingly the students weren't wow'd by it. Richard chose Daniel. They then walked over and took all the gold tape and refused to let anyone have any at all! Not well received from the other designers when they wouldn't even let another team use some for trim. First they starting by shaping the duct tape on the form and then realized it was much easier to make the fabric first. The inspiration was the movie Sixteen Candles. I did like the latticework they created as a detail. Unfortunately I think the two of them have a tendency to tacky that found it's way into the design. Patricia and Samantha were a pair by default. These two have very different aesthetics and working styles so it was a challenge. In fact, most of the other designers prefer not to work with Patricia. It has nothing to do with her ability, it's just the way she designs and her creative process comes from such a unique place that it's confusing to others. Patricia decides to make fabric. Samantha is worried about time, but backs down. For a while they just go about creating separate pieces until Tim jumps on them. While it came together in the end, I was totally floored they got the most votes from the students. Top designs in my opinion were hands down the looks created by Michelle/Amanda and Stanley/Layanna. I think either could have been picked the winner. Michelle is so unique in her design work. I think she was given the win because the design was so obviously influenced by her aesthetic and it was such an original concept. Judges comments included - modern, fun and slightly sinister; every high school fantasy; Gwen Stefani. Stanley could just have easily been given the win in my opinion. His inspiration came from cartoon animation. Judges comments included - totally in love with this; a complete look; modern, fashion forward and cool; so much depth and movement. I don't think Amanda had enough of her own viewpoint in the garment and Layana spent too much time second guessing everything to be considered for the win. I loved both designs and glad the final choice was not mine. I am at a loss as to why the students and the judges seemed to like Patricia/Samantha's dress. Nina felt the students liked it because reminded them of Katy Perry. Perhaps. The skirt fabric Patrica made was an interesting element and the back of the bodice was quite nice, but the front was boring. Overall it looked like something from a Sci-Fi movie. My notes say the judges gave this a top 2 finish, but Stanley/Layana's dress is just a lot better on every front. Could be the student vote was a factor. No one particularly liked Richard/Daniel's offering, mostly because they felt it was dated and old. The lovely lattice work was appreciated once it was seen, but as the designers chose to hide it under the arms, this detail was lost on the runway. Nina was the most brutal - from heroes to zeroes, la mariachi prom, one dimensional. This one was in the bottom 2. Not my favourite, but I know girls who would wear it. Kate/Tu were well received by the students, but the judges were not fans. I do want to make one comment here - neither Heidi or Nina had ever went to a prom. They had absolutely no idea what girls wear and went so far as to suggest long dresses were out. Zac did try and educate them a bit, but it definitely influenced their judging. That said, the challenge was to be creative and design something new and fresh. I don't think Kate/Tu accomplished that. The gown was like thousands of others worn on a regular basis and the colour was dull compared to the other dresses. Judges comments include - it doesn't feel fun, the skirt is so tight she can't move, it's old fashion and square, with 38 colours and prints to choose from you chose this? In the end Kate was sent home because the design and tape choices were hers. Tu really just went along for the ride, so in my mind he should have gone home because he didn't put himself out there at all. At least Kate had a point of view. 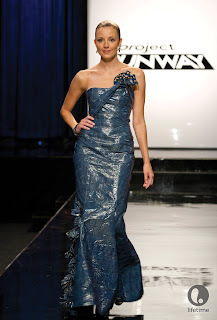 If you want to see larger images of any of these designs, check out Rate the Runway.